Imagine a home in which every appliance — computer, television, washing machine, refrigerator, air conditioner — can carry on a minute-by-minute "conversation" with the local power grid, allowing the devices to power down when the price of electricity is at a premium and to consume energy when it is cheapest. Such smart-grid technologies can lead to increased energy efficiency, lower electricity costs and a significantly reduced carbon footprint. Now imagine an entire building outfitted with this technology — or an entire city — and the potential for savings and sustainable energy becomes clear. "UCLA is like a little city — Pasadena, Burbank and Glendale are not much bigger," said Rajit Gadh, director of UCLA's Smart Grid Energy Research Center (SMERC) and a professor of mechanical and aerospace engineering who specializes in wireless smart-grid technology. "With a city like UCLA, we can test our concepts very quickly, as well as conduct very interesting tests." With major funding from the U.S. Department of Energy and the Los Angeles Department of Water and Power, Gadh and his colleagues from the UCLA Henry Samueli School of Engineering and Applied Science are leading the charge to build and test innovative smart-grid technologies that could lead to major breakthroughs for power infrastructure and reliability. And now, UCLA Engineering has entered into a 10-year partnership with the government-supported Korea Institute of Energy Research (KIER) in South Korea to collaborate on smart-grid research and the development of new technologies with the aim of creating a robust smart grid on an international level. As part of that effort, Gadh's team is using the campus — in particular, Boelter Hall and the Engineering IV and V buildings — as an experimental lab to observe how wireless sensing and control systems can help create the smart grid. They are retrofitting these structures with cutting-edge sensors and smart meters that can, for example, gauge and adjust the amount of power needed in a room at a particular time of day and control appliances, lights, and heating and air-conditioning systems depending on energy pricing or power availability on the grid. Gadh's reputation for innovation in wireless smart-grid applications caught the attention of the Koreans, whose government is investing large sums to develop clean technology and renewable energy. "KIER has a strong interest in energy-efficiency technology and R&D due to its importance in terms of energy savings and the reduction of carbon dioxide," said Tae Hyun Yang, KIER's principal researcher on the joint project with UCLA. "Dr. Gadh came to our attention via Dr. Jung-in Choi, a Korean professor who had worked with Dr. Gadh for a year. In addition, KIER is well aware of the growing reputation of UCLA Engineering in this area of work." Choi, who has also been working on smart grid research since 2005, came to UCLA on sabbatical from Kyungwon University and learned about Gadh's research through several news articles. "I think UCLA's Smart Grid Energy Research Center is one of the most active research institutes in the smart-grid field today," he said. "In particular I have been most interested in the open architecture platform for the smart grid — Dr. Gadh's WINSmartGridTM in particular. KIER needs an open architecture platform technology, and I thought a partnership between KIER and SMERC would be beneficial for both." 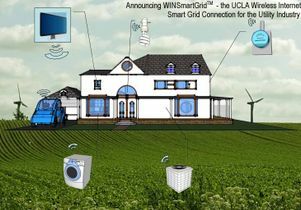 The UCLA WINSmartGridTM (Wireless Internet Smart Grid) is a network platform that allows electrically operated machines and appliances such as plug-in electric vehicles, washers, dryers and air conditioners to be wirelessly monitored, connected and controlled through a wireless communications framework. The technology connects the machines and smart meters to the WINSmartGridTM web service, which receives real-time feeds from utilities and external sources on the price of power at any time of day and other information. Control signals can subsequently be sent via the WINSmartGridTM network, which in turn can dynamically control various appliances in real time. "We're also working on being able to send a signal for electricity to flow back into the grid, be it energy that has been collected by solar panels or electricity that has been stored in the batteries of electric vehicles," Gadh said. "Utilities want to be able to do that, and some are willing to pay for it. So now the priority is to demonstrate that. Once we demonstrate it, people will create markets for it. This research is important to KIER too." Gadh envisions electric vehicles guzzling energy into their batteries overnight, when power is cheap, and then dispensing it back into homes and offices during the day, when electricity demand is at its highest. In UCLA's Parking Structure 9, located next to the retrofitted engineering buildings, Gadh has installed two EV charging stations with devices that collect and wirelessly transmit data about electricity usage back to his lab. 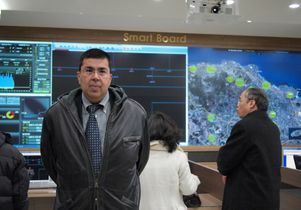 As part of Korea's effort to grow its technology and knowledge in the area of green and renewable energy, the country in 2009 launched a national smart-grid demonstration project with the construction of a smart-grid test-bed on Jeju Island. The test-bed will become the world's largest smart-grid community, allowing the testing of the most advanced technologies. By 2013, total of 64.5 billion Korean won (approximately $5.6 million) is expected to have been injected into the project. On the island, KIER has also established its own Jeju Global Research Center, which just opened this month. In particular, the center will be working on the application of renewable energy resources to the Jeju smart-grid project. "SMERC is good at developing the software and platform, while KIER is strong in various renewable energy technologies, such as solar, wind and fuel cells," said KIER's Yang. "We are confident that the collaboration between the two research groups will create more efficient and faster results." "Korea is also very advanced and sophisticated when it comes to wireless communications. They already have a lot of advanced wireless communications and semiconductor systems," Gadh said. "In addition, I'm impressed with the amount of resources the Korean government has put into the smart-grid demonstration project already and how much they believe in it. A meeting of the minds is critical to our project, and I would be thrilled if our research gets integrated onto Jeju Island one day." The UCLA Henry Samueli School of Engineering and Applied Science, established in 1945, offers 28 academic and professional degree programs and has an enrollment of more than 5,000 students. The school's distinguished faculty are leading research to address many of the critical challenges of the 21st century, including renewable energy, clean water, health care, wireless sensing and networking, and cybersecurity. Ranked among the top 10 engineering schools at public universities nationwide, the school is home to nine multimillion-dollar interdisciplinary research centers in wireless sensor systems, nanoelectronics, nanomedicine, renewable energy, customized computing, and the smart grid, all funded by federal and private agencies. UCLA's Rajit Gadh at Jeju Island in Korea.